Match day 15 in Ladbrokes League 2 threw up a cracker at Galabank as Annan defeated Elgin City to put a win less November behind them. Manager Peter Murphy made a couple of changes to the starting line up, Scott Hooper was replaced by James Creaney due to illness, and the more noticeable change was Alex Mitchell replacing Jim Atkinson in goal for his first league start of the season. It was the visitors that started the game brighlty, winning a corner in the second minute and Mitchell was instantly called upon to punch clear. Mitchell was alert again to save Dingwell’s shot although the flag was already raised for offside. Annan took the lead with their first attack of the match int he fifth minute. Aidan Smith finished clinically from the edge of the box to score his 11th goal of the season. Elgin looked to respond in the 8th minute as McLeish broke through on goal but his shot was saved brilliantly by Mitchell, with the rebound falling for Cameron who’s shot crashed off the post. Aidan Smith looked good for doubling the lead as he went one on one with Elgin keeper Waters but the keeper stood strong as the Annan striker tried to go around him. Bruce Anderson hit back at the other end with a 20 yard effort being saved by Mitchell in the Annan goal. The game was allowed the flow well by referee John McKendrick with several hard challenges waved away but that came to an end in the 32nd minute with 3 players going into the book together after a foul from Moxon, things got heated and Waters, McHardy and Moxon all recieved yellow cards. Elgin played some impressive football going forward, Reilly and McLeish linked up well on the edge of the box but McLeish’s shot was hit wide of the target. Rabin Omar was presented with a chance at the other end but dragged his shot wide. Thomas Reilly had the last chance of the half for Elgin but a fine 45 minutes for the Annan keeper was topped off with an outstanding save to deny the close range shot. It was Annan that started the second half more positively as they pushed Elgin to open up the lead. A Sinnamon corner was half punched clear by Waters but only to Peter Watson who stabbed a shot towards goal but the Elgin keeper recovered to clear his line. Annan managed to double their lead in the 57th minute with another dangerous Sinnamon corner, finished off by Peter Watson to give the hosts a 2 goal cusion. 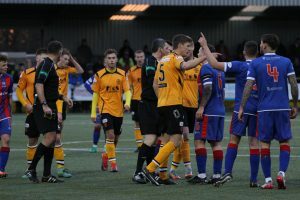 Cameron Eadie looked lucky to stay on the park after a bad foul on Aidan Smith caused an uproar on the terracing as the referee only awarded a yellow, along with his team mate Anderson, Elgin looked to be letting their frustration show, picking up 6 yellow cards during the game. Reilly hit a free kick just over the bar before Dingwell saw his solo effort flash past the post as Elgin looked to get back into the game. Orsi had a shot deflected for a corner and Swinglehurst went close to scoring the third. With less to do in the second half Mitchell remained alert to make a good save and deny Byrne. Loan signing Ferguson linked up well with Henderson with the latter getting a shot away, but a good save from Waters denied him. Aidan Smith shouldv’e put the game to bed with a storming run to the back post to meet Brannan’s cross but the ball seemed to get stuck under his feet and the chance was gone. Murphy brought on his assistant Rutkiewicz to tighten up at the back and see the game out which they did brilliantly. A very well deserved victory for Annan to kick start December. ANNAN ATHLETIC- Alex Mitchell (GK), James Creaney, Jack Brannan, Owen Moxon (Ross Ferguson 45), Peter Watson, Steven Swinglehurst, Dan Orsi (Brandon Luke 84), Ryan Sinnamon, Aidan Smith, Blair Henderson (Blair Henderson 90), Rabin Omar. SUBS NOT USED- Jim Atkinson(GK), Ayrton Sonkur, Peter Murphy. ELGIN CITY- Marc Waters (GK), Cameron Eadie, Jordan Allan, Darryl McHardy, Stephen Bronsky, Jon Paul McGovern (Declan Byrne 80), Bruce Anderson (Chris Dodd 65), Thomas Reilly, Chris McLeish (Lewis Strapp 89), Brian Cameron, Tony Dingwell. SUBS NOT USED- Calum Ferguson, Ali Sutherland, Trevor Dear. Referee- John McKendrick. Assistants- Stephen Mitchell, David Burns.